So I've been obsessively watching American tv show Ace of Cakes. This has sparked a new challenge in me and I've decided to try to make fancy cakes. My first attempt was tiring and slightly stressful but I enjoyed the challenge. I have to admit that I didn't think it tasted that great (although Justin eats a slice every night), but I think that was partly due to the fact that I don't have a electric whipping machine. 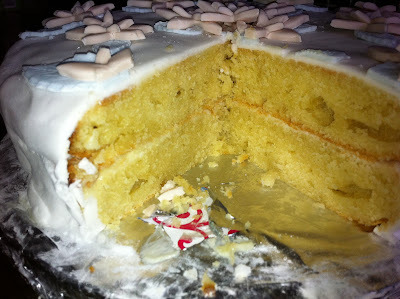 I was whipping everything by hand and so that cake came out a little dense and not as fluffy as it should have been. I was going to make my own fondant but then I saw some already made stuff in the shop and decided to try that as my first attempt. As I said, the cake came out too dense and so it wasn't as high as it should have been. But still I stacked the cakes with a layer of homemade buttercream in the middle. I later realised I should have doubled the buttercream recipe because it wasn't enough to cover the the sides of the cake enough and the cake was a wee bit dry. But still I kept on going. 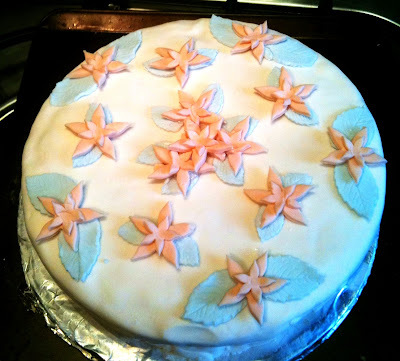 I grabbed a blob of fondant and decided to stencil cut some leaves and flowers. I would have loved more colour variation but all I had in the flat was blue and red. So I made some pink flowers and baby blue leaves. I would have liked the colours to be more vibrant but it's pretty impossible with regular food colouring, I need to find some concentrated food colouring paste/gel. I rolled out a large piece of fondant to cover the cake, it cracked a wee bit on the side where the cake wasn't properly covered with butter cream, and was a little lumpy on the top, but covered the cake nicely. I then proceeded to place the leaves and flowers. Not sure what to use to stick them on I used liquid glucose, but I suppose honey would have done just as well. As this point I hadn't known the trick of melting the fondant area you would be using to make it sticky. I'd have to say it wasn't too horrible for a first attempt considering I didn't have everything I wanted or needed to make it. I think I'll use a different cake recipe next time, and maybe try to do some piping instead of just fondant stencils. I might also make my own fondant this time since I find the store bought one to be too sweet. Because I wasn't happy with the taste, I won't post the recipes here, I'll wait until I've found something more edible! !